I was completely overwhelmed by the numerous offers of help making this one of my smoothest running trial so far. So a big thank you to Yaz Whitehall, who not only scribed and did running duties all day, Tracey Alker and Rodney Veazey for scribing the L3 searches, Liz Hodgson, Rick Burgess & Chris Clements for running duties and off course Marney Wells & Geof Dixon for being superb judges. 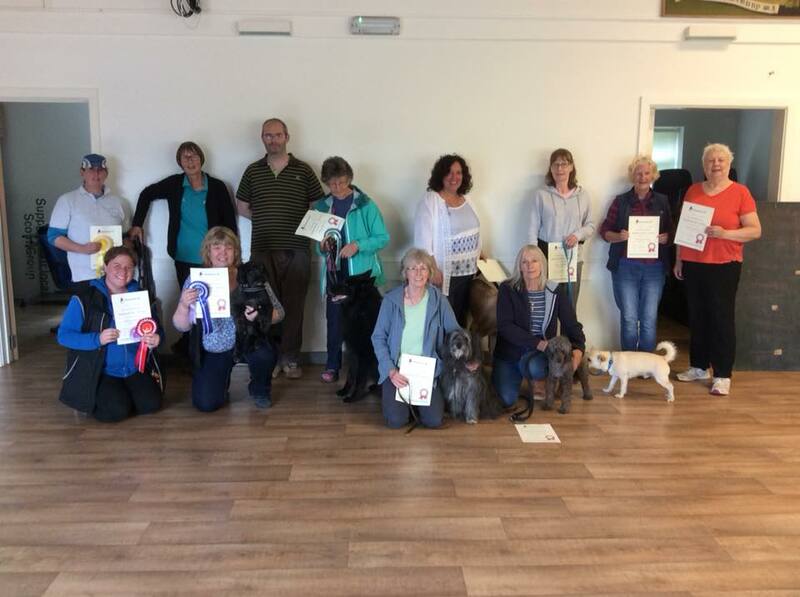 The L3 searches were shared by both judges, doing two elements each, and although this took a lot of organising it did mean that all the judging and presentation was over by 1pm. As with all trials there were some highs and lows but for those that didn’t qualify this time please remember that others have said that L3 is a big jump from L2. Although I didn’t see many of the searches what l did see was many handlers pushing their dog to search a box/bag or chair ‘again’ after their dog had already told them it wasn’t there. The afternoon started well as Geof and Sue brought a fabulous picnic once again and the chocolate brownies which went down a treat, fired everyone’s enthusiasm for the afternoon’s entertainment. .
We had 10 runners in L6 and although Marney set a straight a forward test, most teams struggled particularly with the outside searches maybe because it was rather windy weather. So going into the last search we had just 3 teams that had a chance of qualifying providing they managed to get all 3 finds. Unfortunately this wasn’t to be for two of the teams which resulted in just one qualifier. 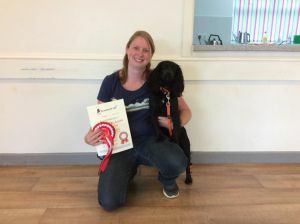 So huge congratulations to Becky Harris and her lovely cocker ‘Flossie’ for qualifying and winning amidst what seemed to be a challenging L6 trial. I would like to thank all the people that stepped in and helped me on the day. Both Yaz and Rodney were a great support scribing for me. Thanks to Rick who made sure that there was always a team ready to start as one team was finishing. Also to Heather for inviting me to the trial and having the day organised and well run. Lastly Christine who despite not have her dogs working on the day, attended the trial to help, support and spectate. I hope that you got as much from the trial as you gave to us. The first element to run was the cars with a scent on a wheel arch and one on the number plate. There were a varying variety of teams on the day. The best car search was from Dana and Buckle with a lovely search. Michelle and Rio also impressed with Rio knowing the task and showing lot of good attention to the search at hand. Annette and Disney had fun and it was Disney’s enthusiasm that really came across. It was fun to watch Hazel and Noodle’s lots of investigations, checking here and there. At the other side of energy was Kate and Lola. Lola was a nice gentle searcher. Harold and Rosie are a team that I have seen a number of times before and as before they had a good car search that I have come to appreciate from this team. 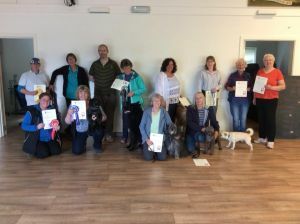 Some of those who had mixed results over the day had some good searching in parts and have good foundations to build on. Both Pat and Arthur, Linda and Tassel I noted had good searches. I went on to the exterior element with 2 early finds. One amongst some garden canes and one in some brick work. The best search here was from Jenni and Solly. It was a great watch and show how much of a difference having so much confidence in Solly makes. I thought that Kate and Paddy make a team that are great to watch working. Despite Paddy not being focused completely Kate does a very good job of handling Paddy and her commitment to him comes through. I thought on the car Kate with Kiwi had a nervous start and it was nice to see that she had put the nerves behind her for this search and Kiwi worked well. The most nail biting search was for Julie and Betty. They had searched as a team really well throughout the day. On this search, and we have all done this, they searched every article apart from the one with the scent hide. All was good in the end as they turned around and found the scent. Last to run on this element was Delores with Gypsy. Gypsy is another high energy searcher who was throwing in little bits of extra searching, she kindly cleared the door of the hall just to be certain that she had checked everything. Thank you all for attending and sharing your teamwork with the judges.